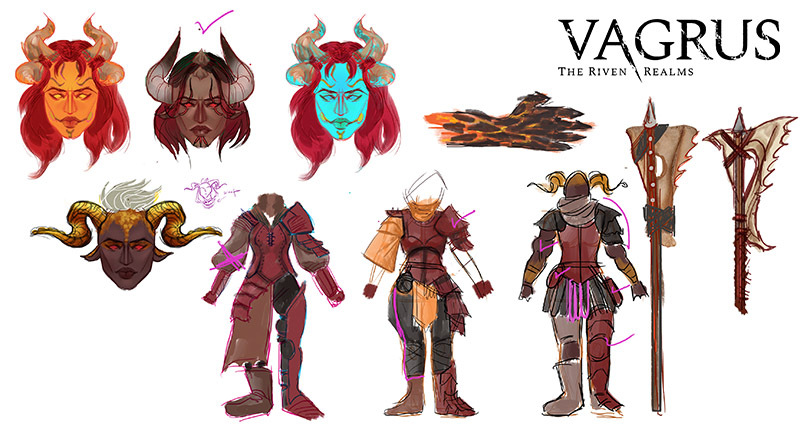 In Devlog #7 - Character design - Part 1 we talked about the types of characters in Vagrus, focusing especially on Companions and their roles in the game. Now it's time to move onto the topic of what exactly goes into the graphic design phase of these characters. First and foremost, a few considerations on the choice of art style. Vagrus is a 2D game and character art leans distinctly towards a comic book representation but on the serious, more realistic, and darker side instead of a cartoonish approach. The reason for this choice is manifold and the primary one was that we liked it and it matches the setting. It is also relatively easy to handle and iterate, which is important when you have so many characters and enemies as we do. Bazsó helped with the initial choice of character art style and we also found Szonja who wanted to work with such a design so it was a match made in heaven. Then there's the choice of the animation style. The use of parallax movements and effects instead of detailed animation for combat skills lives its renaissance now thanks to hit games like Darkest Dungeon. We love the way it looks and also meshes well with the more comic book look of the characters, so the choice was a no-brainer. With the right timing and effects it looks visceral, which fits the setting better, too. The exception is the idle phase of characters, which will be slightly animated to avoid a still-image-like rigidity. So with all the design choices behind us, let's see how we approach character visual design at Lost Pilgrims. It all starts with a call for a character art asset to go with a character design established sufficiently by the designers. Because of the vast amount of lore for the world, there's already a good idea of how the character and its combat skills should look and feel. The briefing also includes background information on the character, about its intended role, and appearance. People in the Riven Realms partially take after real world cultures more often than not. What makes it extra interesting is that since this is a post-apocalyptic world, we often have to start out with choosing one historical influence for the times before the cataclysm and then modify and blend that reference into another one that's more appropriate for the current times. You can see an example with the Sadirar, who were once similar to the ancient Greek civilization of real life Earth but were forced to live in endless deserts later. Their features may still resemble that old look but now as desert dwellers, their traditional apparel shifted to a more tribal-looking one. Of course, cultural influences are usually set for a roster of characters from the same background before working on them, and very rarely on a character by character basis. We have strict rules on what type of materials are available in each region and in general as well (it's a metal-starved world, after all). We have to consider each environment from different perspectives. What kind of animals live there that people can harvest to produce armor? What resources and materials are available for crafting tools? While people of the Ashlands have huge snails roaming their lands, the shells of which they can integrate into their armor, the Sharduk would use the hides from their fallen giant lizard mounts to create clothing. Since many beings were mutated or were mixed with other creatures, for example, the half-draconic Dragonkin or the Tainted, we often design fairly weird-looking characters that match the overall dark fantasy design. 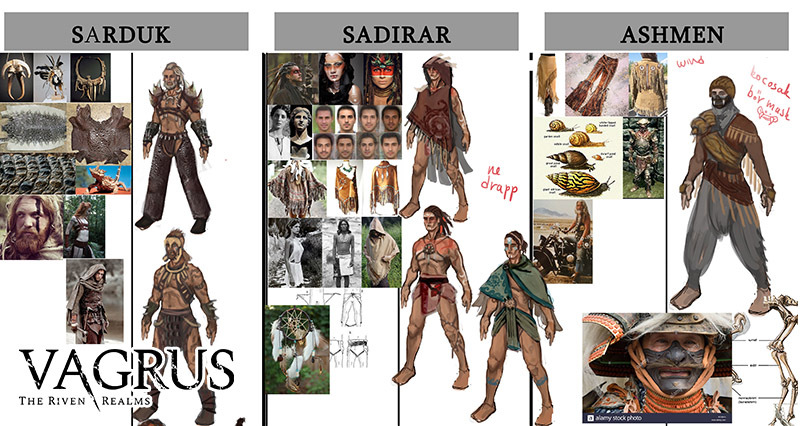 For the most important characters and for distinct cultures, the next step is the creation of the moodboard with all the above in mind. 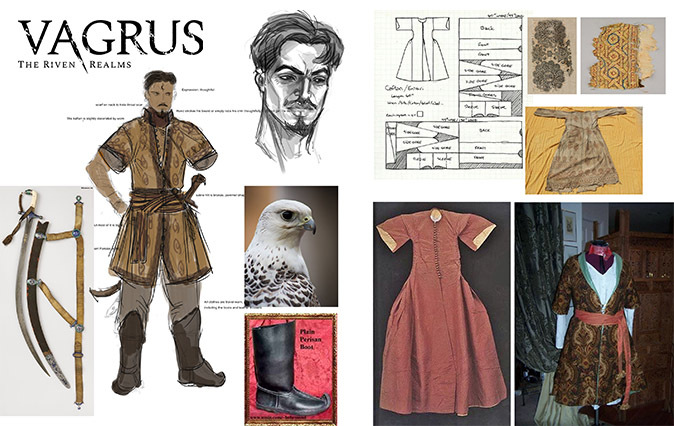 Szonja gathers images and creates sketches that will serve as a basis for the look and feel of the characters or culture, and some of it will be incorporated into the character designs. In the next part of Character Design, we'll talk about the steps and techniques involved in drawing the characters and placing them into the game. Be sure to check that out, too!